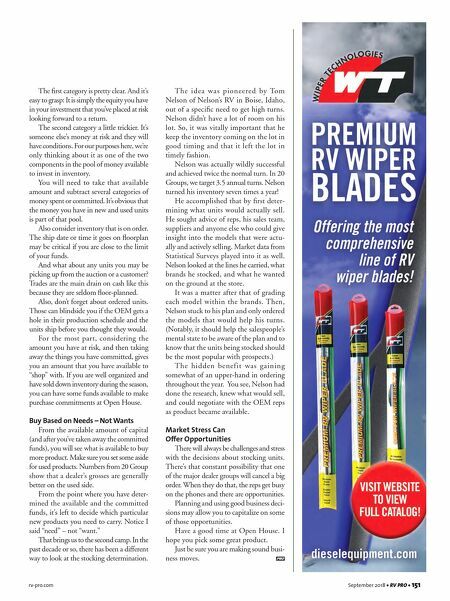 rv-pro.com September 2018 • RV PRO • 151 The first category is pretty clear. And it's easy to grasp: It is simply the equity you have in your investment that you've placed at risk looking forward to a return. The second category a little trickier. It's someone else's money at risk and they will have conditions. For our purposes here, we're only thinking about it as one of the two components in the pool of money available to invest in inventory. You will need to take that available amount and subtract several categories of money spent or committed. It's obvious that the money you have in new and used units is part of that pool. Also consider inventory that is on order. The ship date or time it goes on floorplan may be critical if you are close to the limit of your funds. And what about any units you may be picking up from the auction or a customer? Trades are the main drain on cash like this because they are seldom floor-planned. Also, don't forget about ordered units. Those can blindside you if the OEM gets a hole in their production schedule and the units ship before you thought they would. For the most part, considering the amount you have at risk, and then taking away the things you have committed, gives you an amount that you have available to "shop" with. If you are well organized and have sold down inventory during the season, you can have some funds available to make purchase commitments at Open House. Buy Based on Needs – Not Wants From the available amount of capital (and after you've taken away the committed funds), you will see what is available to buy more product. Make sure you set some aside for used products. Numbers from 20 Group show that a dealer's grosses are generally better on the used side. From the point where you have deter- mined the available and the committed funds, it's left to decide which particular new products you need to carry. Notice I said "need" – not "want." That brings us to the second camp. In the past decade or so, there has been a different way to look at the stocking determination. The idea was pioneered by Tom Nelson of Nelson's RV in Boise, Idaho, out of a specific need to get high turns. Nelson didn't have a lot of room on his lot. So, it was vitally important that he keep the inventory coming on the lot in good timing and that it left the lot in timely fashion. Nelson was actually wildly successful and achieved twice the normal turn. In 20 Groups, we target 3.5 annual turns. Nelson turned his inventory seven times a year! He accomplished that by first deter- mining what units would actually sell. He sought advice of reps, his sales team, suppliers and anyone else who could give insight into the models that were actu- ally and actively selling. Market data from Statistical Surveys played into it as well. Nelson looked at the lines he carried, what brands he stocked, and what he wanted on the ground at the store. It was a matter after that of grading each model within the brands. Then, Nelson stuck to his plan and only ordered the models that would help his turns. 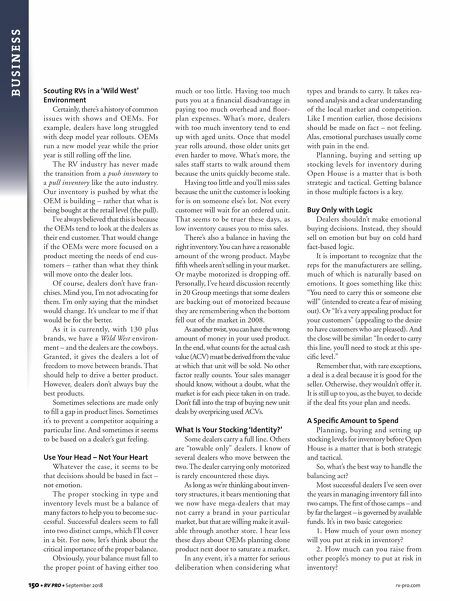 (Notably, it should help the salespeople's mental state to be aware of the plan and to know that the units being stocked should be the most popular with prospects.) The hidden benefit was gaining somewhat of an upper-hand in ordering throughout the year. You see, Nelson had done the research, knew what would sell, and could negotiate with the OEM reps as product became available. Market Stress Can Offer Opportunities There will always be challenges and stress with the decisions about stocking units. There's that constant possibility that one of the major dealer groups will cancel a big order. When they do that, the reps get busy on the phones and there are opportunities. Planning and using good business deci- sions may allow you to capitalize on some of those opportunities. Have a good time at Open House. I hope you pick some great product. Just be sure you are making sound busi- ness moves.